Sorry, NO Pets allowed in the fair! Fair hours: Gates open by 8am; Buildings open at 9am. Buildings close at 9pm. Outdoor events may run later. We have big plans in the works for 2019! A week filled with agricultural exhibits, displays and exhibitions, and a great mix of entertainment is headed your way! Save the dates! New this year – RaveX Outer Limits Tour on Monday evening! 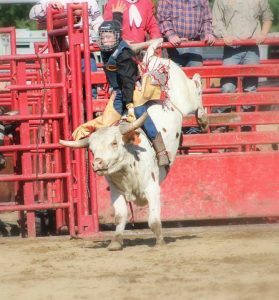 Rawhide Rodeo with shows Wednesday and Thursday evenings! Message us on Facebook with your ideas: Cumberland Fair – official Facebook page. For daily updates throughout the fair, take a second to ‘like’ our facebook fanpage! Secured and Maintained by Megabotix LLC.